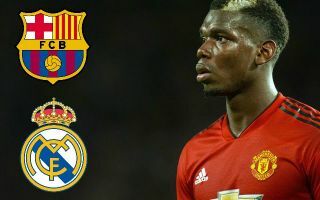 Manchester United midfielder Paul Pogba has dropped a somewhat worrying transfer hint amid speculation linking him with Barcelona. The France international has endured a difficult start to the season at Old Trafford, following a disappointing campaign last season as well. It seems increasingly clear that Pogba doesn’t look an ideal fit for United manager Jose Mourinho, and speculation surrounding his future has been circulating for some time. Most recently, Don Balon have linked the 25-year-old as a top target for Barcelona, who could be willing to sell influential player Ivan Rakitic to make room for the Red Devils outcast. Meanwhile, the Daily Mirror report that Pogba and Mourinho have reached an agreement of sorts, with the former Juventus man happy to wait for a move, despite being expected to push for one again next summer. When asked about his situation, Pogba is quoted in the Metro as dropping more worrying hints that he could look to move on in the near future. He didn’t exactly speak in glowing terms about his manager, and wouldn’t rule out leaving United in a few months. Paul Pogba heading out of Manchester United? ‘There was a lot of talk, but it was just like that, I’m under contract in Manchester,’ he told Sky Germany. ‘My future is currently in Manchester, I still have a contract, I’m playing there at the moment, but who knows what will happen in the next few months. Some United fans may not be too bothered about Pogba leaving considering his relative lack of impact, though it seems clear there is a talented player in there somewhere, so may also not trust Mourinho’s judgement as he’s seemingly failed to get the best out of him.